Purchase Your Tickets Today for the Upcoming Gloucester Garden Tour! We hope you can join us and please help spread the word. The funds raised will go directly towards maintaining the Fishermen’s Wives Memorial and Gardens and the butterfly gardens at the HarborWalk. 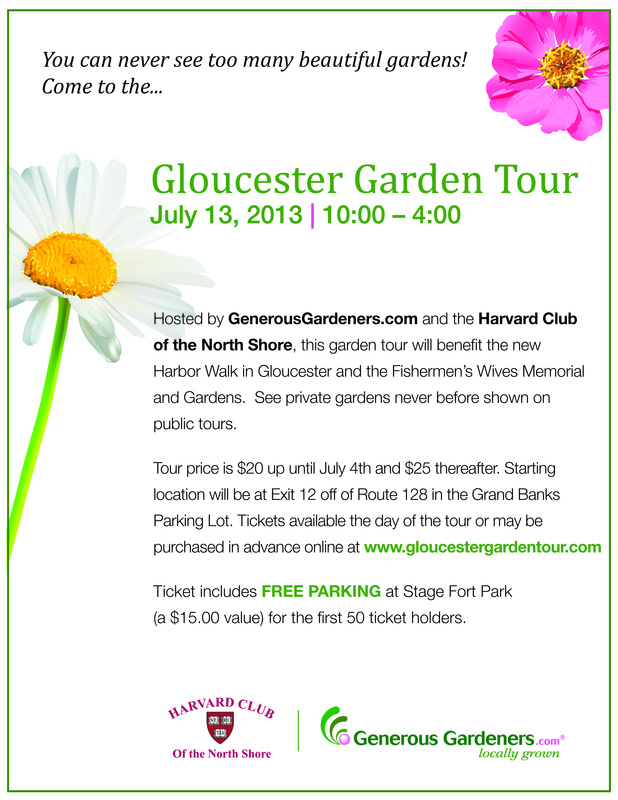 The tour is hosted by GenerousGardeners and the Harvard Club of the North Shore. I am going to be at the HarborWalk Gardens throughout the day to answer all your habitat gardening questions. And I will be giving two guided tours, the first at 1:00 and again at 2:00. Today is the last day you can purchase tickets at the 20.00 price. Tomorrow they go up to 25.00. For the first 50 ticket holders, free parking at Stage Fort Park is included. Susan shares this photo of a female Ruby-throated Hummingbird that frequents her garden. If you want female hummingbirds to choose your garden to build their nests nearby, I recommend putting your hummingbird feeders out early, in March and April. Northward migrating hummingbirds are in need of nourishment by they time they reach our shores. Their diet consist primarily of small insects; there are few insects on the wing and even fewer nectar plants blooming. I place my hummingbird feeders above early blooming Red Riding Hood Tulips. Although the tulips do not provide nectar, the red flowers lure them to the hummingbird feeders. A note about hummingbird feeders. Never add red food coloring or use honey to sweeten the water. To make your own sugar solution, combine 1 part pure granulated sugar to 4 parts water. 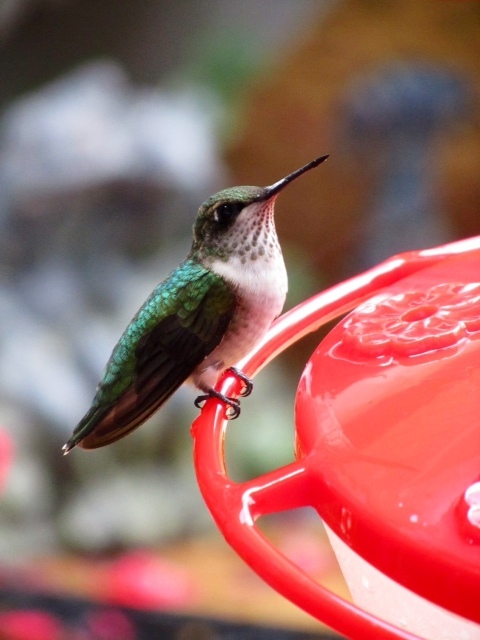 Clean you hummingbird feeders weekly with a 50/50 combination of vinegar and water; more frequently in warm weather. Where, when? Am I missing something? Please click where it says To Purchase Tickets. Thank you. I always boil my 4 cups of water then add the 1 cup of sugar and stir until it is dissolved. I find whatever I don’t use immediately in the feeders stores nicely in a covered container in the refrigerator for a week or so. Love those hummers. Therese you are welcome–thanks for your comment! No need to boil the water if small quantities are made every several days. If large batches are made then boiling the water is necessary. Because the sugar water forms a medium on which bacteria grow, even when refrigerated, the mixture should be discarded after a week. I didn’t know that. Thanks! Now that I’ve moved to a little apartment with a porch and limited space for flowers do you have any suggestions for attracting butterflies and hummingbirds to container plantings? Zinnias especially for butterflies, the compact ‘Profusion’ series is wonderful, also dwarf ‘Sonata’ series of cosmos–just two that come to mind right away. Also for the butterflies, especially Monarchs, Easter Tiger Swallowtails, and Painted Ladies, all love to nectar from Lantana camara. Nearly any mid-sized butterfly attracting perennial can be grow in pots, including coneflowers, Black-eyed Susan, salvias–maybe not so much milkweed! Pots of parsley will attract female Black Swallowtails. For the hummingbirds–every year I winter over my bougainvillea and bring it outdoors after all danger of frost has passed–wonderful hummingbird attractant. Also mandevilla, dipladenia, and fuschia are great container plants for hummingbirds. Cardinal Climber, a member of the Ipomea family, is a beautiful delicate twining annual vine that can be grown in pots. More ideas to come. Excellent, thank you. I’ve always wanted to get a Bougainvillea. Now it’s on my shopping list. Have a good day and see you Saturday for the butterfly talk at 1:00. If you enjoy my little daily blog of life on the dock, feel free to subscribe. Its the best way to keep updated of fresh new posts. If you find any of the posts entertaining I really appreciate feedback in the comments section under each post. We update every hour on the hour from early morning til night. Check Back Often! As long as supplies last if any GMG folks want a bumper sticker but can't drop down the dock, just send a self addressed and stamped envelope longer then 7 and a half inches and I'll drop one in the mail for you. Click For The GMG Theme Song Gloucester Til The End! Joey Ciaramitaro on It’s Official! Ed Collard on It’s Official! Marty Luster on It’s Official! Donna Ardizzoni on It’s Official! Kim Smith on It’s Official! A Tale Of Two Weddings In Photos. 2011 2012 2013 Art Art Haven Beautiful Industry Block Party Cape Ann Cape Ann Animal Aid Cape Ann Community Cinema Cape Ann Museum Captain Joe's Captain Joe and Sons Chickity check it! Craig Kimberley Dancing David B. Cox David Cox Donna Ardizzoni Downtown Gloucester Eastern Point Eats entertainment Family FLY AMERO Fredrik Bodin gloucester Gloucester at Dawn GloucesterCast Gloucester Harbor Gloucester Ma Gloucester Smiles GMG GMG Sticker Good eggs Good Harbor Beach Good Morning Gloucester GoodMorningGloucester Greasy Pole Greg Bover Joey Ciaramitaro Kim Smith live music lobster Lobster Boat Local Madeline Main Street night life Niles Pond Passports Paul Frontiero People Photography Podcast Rockport Rocky Neck Rubber Duck Saint Peter's Fiesta Sawyer Free Library Schooner Seagull Sharon Lowe Sista Felicia Sista Felicia Eats Slide Show Smiles Stacy Boulevard St Peter's Fiesta The Bean The Rhumb Line Things to do Video visitors What Up Homie?